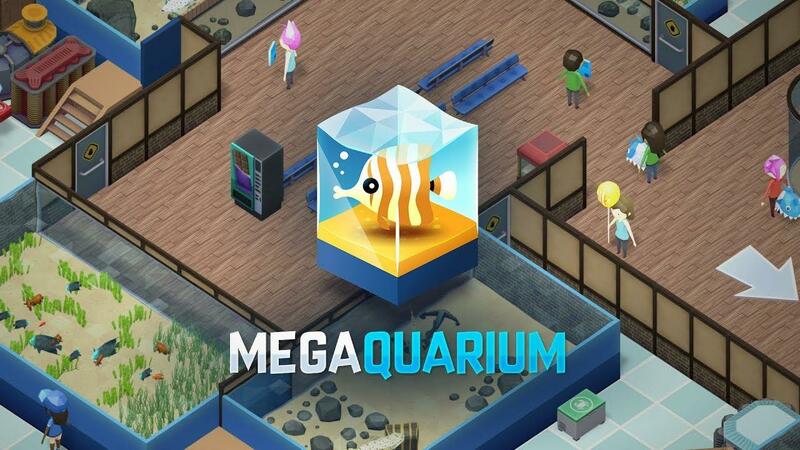 Megaquarium is like theme park for those who love fish and it's now officially available with same-day Linux support. Developed by Twice Circled, who were responsible for the rather good Big Pharma which also has a Linux version. Note: Key provided by the developer. As someone who is fascinated by ocean life, I often visit our local aquarium to learn a little and take it all in. This is probably why Megaquarium speaks to me on a level other such tycoon builders don't. It's such a beautiful game, I'm really surprised by it. Fishes properly move around, you see their fins moving and everything. Honestly, I was expecting something a little less detailed than what we actually got. Fish have different needs, some are wimps and some will bully other fish (slightly amusing that). Some need to be with enough of their own kind to not get lonely as well, awww! It's very much a game where you can literally sit for hours, upgrading, tinkering, moving things around and just relax. I like the real attention to the details too, you can literally pick up an entire tank and move it around any time you feel like your floor plan isn't working. There's all sorts of things you need to deal with, not just the needs of your aquatic life with their likes and dislikes but also keeping your aquarium properly maintained. Equipment can break down, so you need to ensure that you have enough staff to deal with that too. The actual layout of your aquarium is vitally important, since each tank will need equipment to keep your fish happy for filtering and heating, these take up floor space that your visitors cannot use to appreciate the tank. On top of that, you need benches for tired visitors and all sorts of things so you need plenty of space around each tank for people to actually look in as they can only do so when right next to it. When looking in tanks, visitors end up giving you points towards higher ranks (to unlock more) and also for your research. I think my favourite feature might be the ability to zoom in as if you're a visitor, to properly appreciate the layout of your aquarium and watch your fishes to relax. Unfortunately, there's a bug with this in the Linux version where the mouse vanishes when you do this (so be sure to save first…), I did report this to the developer so hopefully a fix will land soon. Absolutely love it, really hope the developer continues to add more content. It has quite a lot already, but I want more! I want to build the biggest aquarium the world has ever seen. You can find Megaquarium on Humble Store and Steam. It's also on GOG, but they don't have a Linux build right now. Damn, first Two Point Hospital and now this. So many great builder games. I've been following the development of this one for a while. It's funny, I really like it though it's a bit different than my usual games. Kinda reminds me of the old zoo tycoon: marine mania. Too bad we don't get whales. Anyway, just in case anyone is interested, have my let's play. The developer has removed the Linux version from the store, although it only seems to be temporary due to a few issues (likely the cursor issue I mentioned). The only other reported issue I can see is on an Intel GPU with outdated Mesa, so I don't think there's that many Linux-specific issues. Draconicrose I've been following the development of this one for a while. It's funny, I really like it though it's a bit different than my usual games. Kinda reminds me of the old zoo tycoon: marine mania. Too bad we don't get whales. Anyway, just in case anyone is interested, have my let's play. I actually bought Zoo Tycoon (and its two expansions) after being inspired by visiting a zoo (the San Diego zoo, maybe? ), and spent a lot of happy hours with it. This looks like a great game, I'll check out your Let's Play while I wait for it to return to Linux.